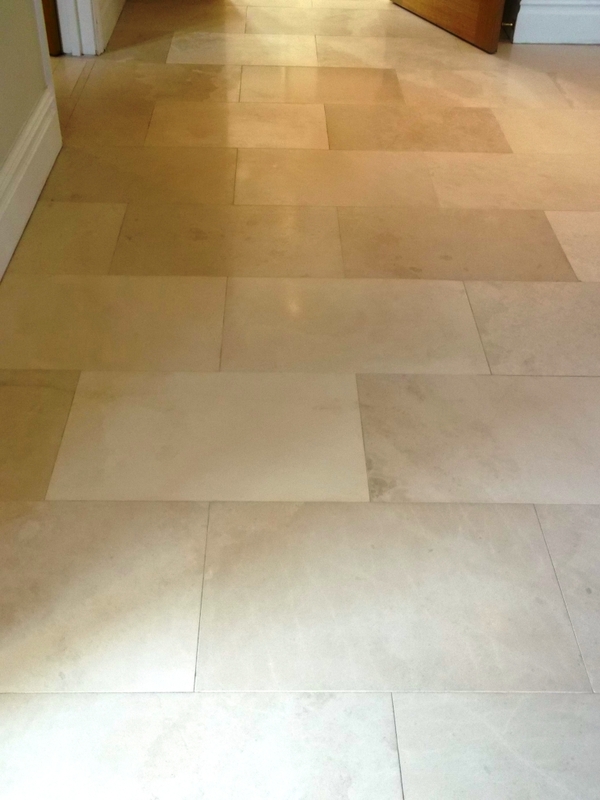 This Limestone tiled floor was around 50m2 and installed in Kitchen and Hallway in a new build style property in Newmarket, ‘The Home of Horse Racing’. The property was only 3 years old and the owner was having difficulty keeping the floor clean. 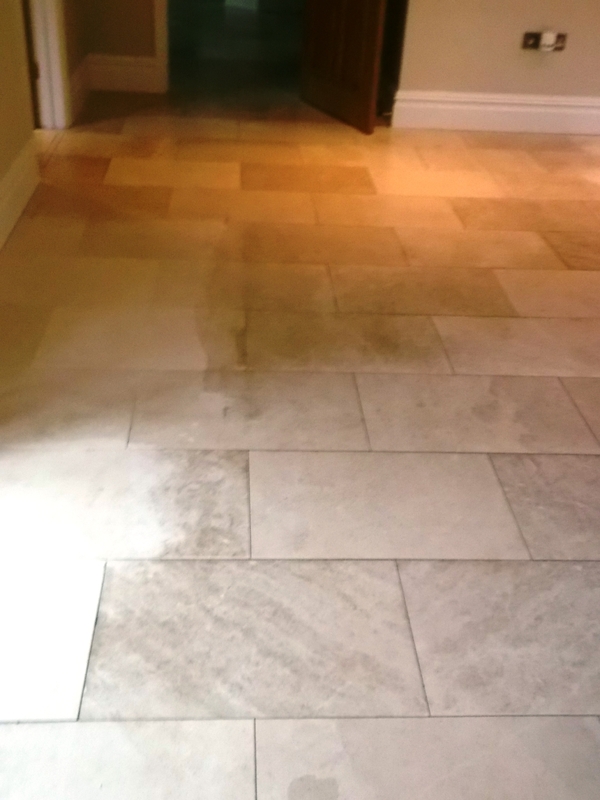 The first step was to scrub the Limestone tiles with a rotary machine fitted with a black scrubbing pad and a solution of Tile Doctor Pro-Clean which is a strong multi-purpose alkaline cleaning product designed for use on natural stone. This process ended up taking all day and requiring a full five litre bottle of Pro-Clean to get the floor how we wanted it, It was after a reasonably large area and we had to repeat the process in some areas. The floor was then rinsed thoroughly with clean water to remove any cleaning products and we then we switched on the under floor heating and left for the day so the floor could dry overnight. When we came back the next day the floor was nice and dry and we set about sealing the Limestone tile with Tile Doctor Colour Grow which provides stain resistance and enhances the natural colour within stone, three coats were sufficient but again due to the size of floor we did use a full five litre bottle. The floor now looks splendid and the sealer has made it a lot easier to maintain, certainly the customer was pleased and left the following comment on our feedback system. This ceramic tiled floor had only been laid in a Kitchen floor in Newmarket just over a year ago. The tiles from the Topps Tiles Padova range did not have a glazed finish to them and therefore the owner was having difficulty keeping them clean on a daily basis. I did a quick search on the Internet and it seems this range of tiles are difficult to remove grout smears from once laid. 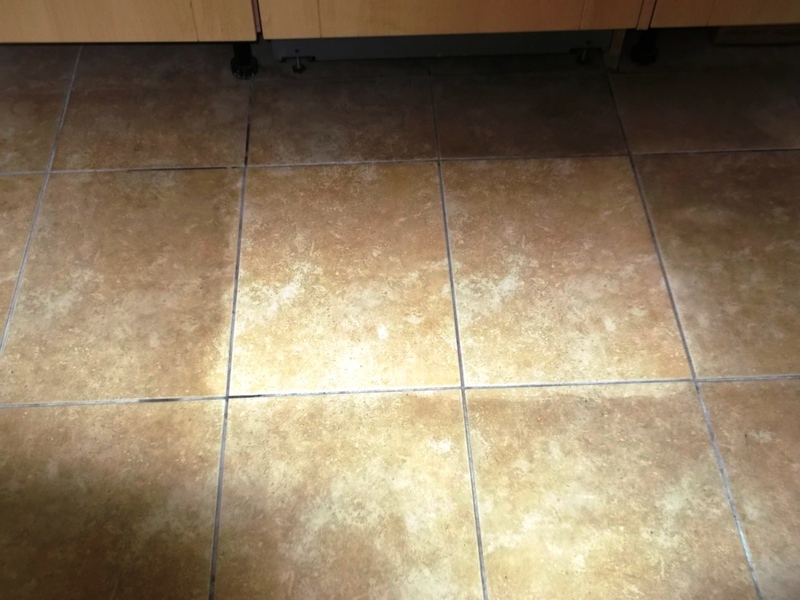 The floor was cleaned using Tile Doctor Pro-clean diluted with 3 parts water to effectively clean the floor and grout removing the ingrained dirt that had accumulated. The tiled floor was 14m2 and required 2 litres of Pro-Clean to get it clean. The photo below clearly demonstrates the improvement in the two tiles which were cleaned before moving onto the rest. We washed the floor down with water to neutralise it and then left to dry for a few hours before sealing it with two coats of Seal & Go which on this size of floor required one litre of product. Normally ceramic tiles won’t take a sealer due to the glazing however in this case a sealer will be necessary to protect the floor.